The Advent tradition of creating a Jesse Tree comes from the verses in Isaiah and Matthew that speak of Jesse, the father of King David. Abraham was the father of Isaac, and Isaac the father of Jacob, and Jacob the father of Judah and his brothers…and Matthan the father of Jacob, and Jacob the father of Joseph the husband of Mary, of whom Jesus was born, who is called Christ. (Matthew 1: 1-16). On each branch hangs a picture of some of the forty-two generations of Jesus’ ancestors from both the Old and New Testaments. The pictures of the Holy Family are often placed at the top. Each paper ornament can be colored by the children for their own personal touch. The ornaments either hang 3-D on your family Christmas tree for home use, or display them on the Jesse Tree Christmas tree poster included with the kit for classroom use. 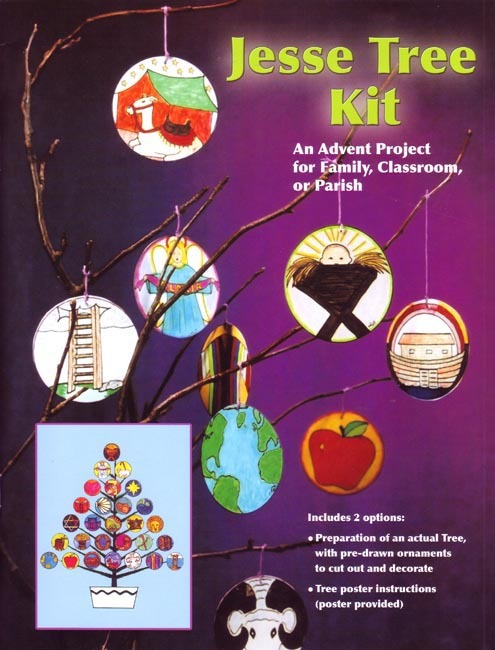 This kit also includes a short history of the Jesse Tree, suggested Scripture verses for each ornament, and a Jesse Tree prayer service. The Jesse Tree is a wonderful Advent tradition that fosters reflection on salvation history as a preparation for the celebration of Christmas. This is a great activity for families, classrooms, and parishes. Includes 28 pre-drawn ornaments. Provides instructions for preparing and decorating an actual tree. A heavyweight 25 x 29 inch Jesse Tree poster is included. Text dimensions: 8.25 x 10.75 inches. 24 pp.